Explanation: Can a planet be as large as the star that it orbits? Recent observations have discovered that nearby Van Biesbroeck's star might have just such a large planet. Although VB 10 lies only about 20 light years away, it is a small red dwarf star so dim, at 17th magnitude, that a telescope is needed to see it. Van Biesbroeck's star was previously known for its rapid proper motion across the sky -- it moves so fast it could cross a full moon in only about 1,000 years. By noting a wiggle in VB 10's sky trajectory, astronomers were able to infer the existence of a planet several times the mass of Jupiter. Although the star VB 10 is perhaps 10 times more massive than the discovered planet VB 10b, the star is likely more highly compressed and so the two might be closely matched in size. Such a system is envisioned above with an artist's illustration. 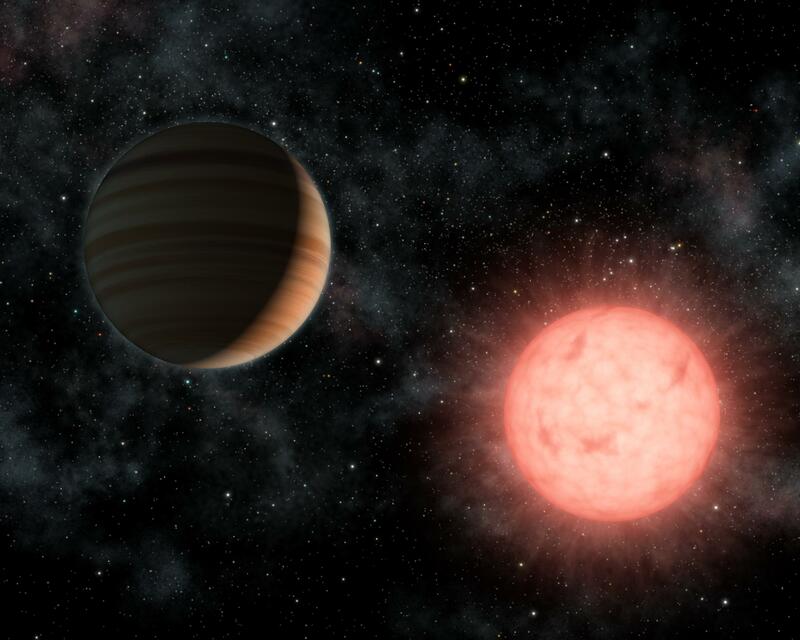 Since faint M-type stars like VB 10 are so common, planetary systems surrounding them, including planets larger than their parent star, might be more common than planetary systems like our own Solar System. Free Lecture: An APOD editor will review great space images this Friday in Kalamazoo, Michigan.